The IBC establishes the minimum lateral seismic design forces for which buildings must be designed primarily by reference to ASCE 7. While ASCE 7 allows use of a number of analysis procedures, the equivalent lateral force (ELF) procedure is most commonly used for seismic design of buildings in the U.S. This is particularly true for low-rise, short-period, wood-frame buildings. The ELF procedure relies on seismic force-resisting system design coefficients such as the response modification coefficient, R (often referred to as the R-factor), deflection amplification factor, Cd, and overstrength factor, Ωo. The R-factor is essential for determining design seismic base shear, V, which is used in the design of elements of the seismic force-resisting system. For short-period, wood-frame structures, seismic base shear, V, is calculated in accordance with Equation 1. ▶ In areas used for storage, a minimum of 25% of the floor live load. 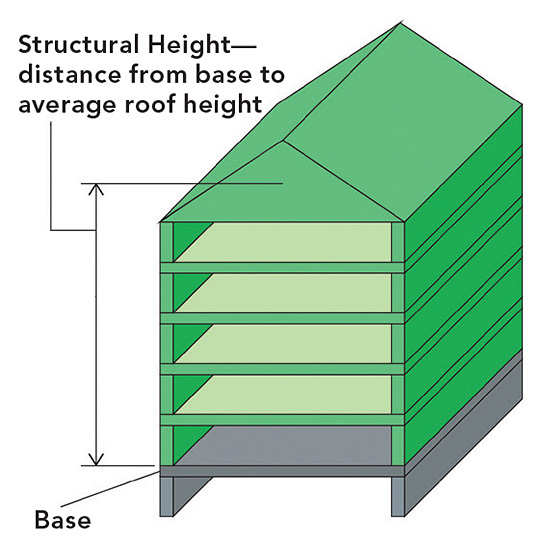 Exceptions: a) Where the inclusion of storage loads adds no more than 5% to the effective seismic weight at that level, it need not be included in the effective seismic weight, and b) floor live load in public garages and opening parking structures need not be included in the effective seismic weight.